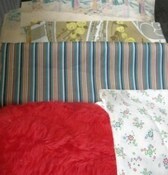 A lot of synthetic fabric can be used when sewing cushions or clothes. an alternative to natural fabrics. Man made or synthetic fabric is a good alternative to natural fabrics. Individually they have their own good qualities and when mixed with some natural fibres it gives an added quality to some that may be lacking in strength for example. Man made fibres cover a large range of different types of materials with many variations of the same type. Many also mimic natural fabric really well and the fabric may be enhanced when using the man made version such as not liable to creasing. These fabrics are made from synthetic fibres. This is usually a liquid form of polymer being blown through fine nozzles to get a really fine fibre which is then spun together and then woven into the material. Rayon was the first of these to be invented and was an artificial form of silk. In 1884 Hillaire de Charbonnay, a French chemist, invented a type that was made from cellulose but it was found to be very flammable and was taken off the market. A safer way of making this artificial silk known as viscose rayon, was patented in 1894 by three British chemists Charles Cross, Edward Bevan and Clayton Beadle. Nylon was invented by Wallace Carothers in 1935 by creating a polymer with a structure like silk but cheaper and that could be made in bulk. Nylon has really lead the way in the market with all the various ways in which it can be used. These fabrics can look, feel and act like natural fabrics but are easier to clean, unlikely to shrink and usually need no ironing. Some types can be substituted for the real thing such as synthetic or faux fur, leather and suede. It is quite difficult at first glance to tell these apart from the real fabric. Lurex is made with a metallic thread to add to the look. One of the beauties of the type of fabric is that it can be made to move with the wearers such like gymnastic, underwear and swimwear garments. They are also very strong strong and are usually mixed with natural fibres to give added features. Polyester and cotton mixed together will be less likely to crease than all natural cotton. wool and nylon mixed together will give a warm but strong fabric. Lovely cushion covers can be made with these fabrics and in some cases are better due to the added features that they give. They come in all kinds of designs and colours. Man-made fabrics can be bought in a lot of shopping outlets.